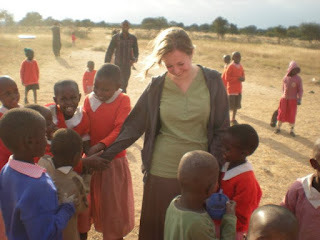 Ok, I know I've been super slow in finishing my posts about Kenya. Just got back from Seattle and preparing to leave for New York in a few days, so things have been a bit hectic. Not that I'm complaining... how awesome to get to see such uniquely beautiful, diverse places all in the same summer! On the second to last day we spent in Illmamen, we had the privilege of visiting a local school where the pastor we stayed with is the headmaster (and his wife is one of the teachers). I have difficulty describing the experience. When we arrived, somewhere around 100-150 beautiful children surrounded us, happy to shake our white hands and rub our white skin and touch our hair. We smiled and laughed along with the children, took their pictures, and then showed them their sweet faces on our cameras, much to their delight. Soon we were invited into a classroom, which was another of many humbling experiences from the trip. As a teacher, I looked around at the concrete walls, dirt floor, tiny room packed with so many children, and the complete lack of school supplies and wondered how I could ever complain about anything regarding being a teacher in our large, air-conditioned, clean, school-supply-filled classrooms full of more textbooks and resources than we know what to do with. And yet, the headmaster told us that this school ranks as one of the top schools among the 29 in the area (based on test scores). A choir formed by some of the older children (the school goes up to sixth grade) sang and danced to several songs for us. It was so beautiful and so much fun! After that, we split up into groups so that half of us (including me) took the younger kids outside to play red light, green light and a Kenyan version of duck, duck, goose, and the other half stayed inside with the older kids to share testimonies. Bobby got to pray with several kids who wanted to accept Christ, so that was really exciting. Red light, green light - stampede of children running straight at us! Before we left, we (through ALARM) presented the kids with soccer balls, a pump for the balls, and some textbooks. On Friday, the last day of the conference, we had the privilege of seeing a traditional Maasai dance. It was absolutely incredible! The men sang a humming baseline while the women sang the melody. They moved their heads in a manner that is distinctly Maasai, sticking their chins out, lifting their heads, and then moving them back in. Periodically, the men would jump up really high and one of the women would call out a shrill, "Aaaai!" noise. They stood together, walked in circles together, and sang and sang and sang. It was my favorite part of the whole trip! I'm so happy that Bobby got it on video. I think part of what made it so amazing is that the people we had been with for the whole week at the conference, the people who for the most part dressed in western-style clothes and spoke English, all of a sudden were united as Maasai as they danced together. I was really glad that even the young people, as they are becoming more urban/westernized, still knew the dance. Pretty awesome experience!